The National Institute for Public Policy’s new book, Minimum Deterrence: Examining the Evidence, is the first of its kind. 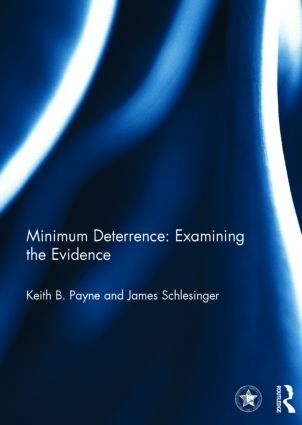 Dr. Keith Payne, the late former Secretary of Defense James Schlesinger and an unparalleled bipartisan group of senior civilian and military experts critically examined eight basic assumptions of Minimum Deterrence against available evidence. In general, Minimum Deterrence does not fare well under the careful scrutiny. Proponents of a "Minimum Deterrent" US nuclear force posture believe that anywhere from a handful to a few hundred nuclear weapons are adequate to deter reliably and predictably any enemy from attacking the United States now and in the future. Because nuclear weapons are so destructive, their thinking goes, no foreign leader would dare challenge US capabilities. The benefits, advocates claim, of reducing US nuclear weapons to the "minimum" level needed are: better relations with Russia and China, reinforcement of the arms control and Nonproliferation Treaty, billions of defense dollars in savings, and greater international stability on the way to "nuclear zero." As political pressure builds to pursue this vision of minimum US deterrence, Minimum Deterrence: Examining the Evidence stands as the seminal study to address the many claims of great benefit against available empirical evidence. This book was published as a National Institute Press monograph, Keith B. Payne and James Schlesinger, Minimum Deterrence: Examining the Evidence (Fairfax, VA: National Institute Press, 2013) and as a special issue of Comparative Strategy.